One year after the arrest of Iranian-British citizen Nazanin Zaghari in Iran, British government once more urged the Islamic Republic authorities to release her. Meanwhile Zagheri’s friends and colleagues gathered together to demand her release. Yet the Iranian government message is clear: these demands are interventionist. Iran responded to the request by referring to it as “interventionist and inappropriate” claiming that Zaghari is guilty of “security charges”. 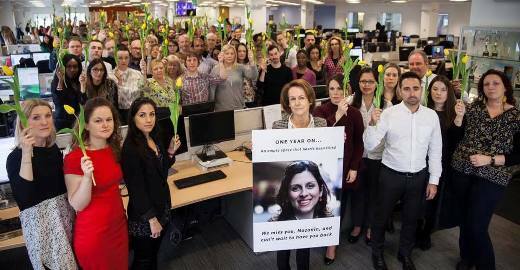 Monique Villa is CEO of the Thomson Reuters Foundation and all Nazanin Zaghari’s colleagues at this institution also gathered with yellow tulips in their hands to support Free Nazanin campaign marked by hashtag, #FreeNazanin, in social media. Amnesty International had high hopes that Zaghari would be released during the Iranian New Year at the start of spring, when customarily some prisoners are granted a pardon or temporary releases. Nazanin Zaghari was arrested on April 3, 2016 when attempting to return to Britain from Iran with her two-year old daughter after a visit. She was sentenced to five years in prison which has been confirmed by the appeals court. She continues to maintain her innocence. Her daughter is now with Zaghari’s relatives in Iran as both their passports have been confiscated by the authorities. The Free Nazanin Campaign, an initiative to secure her release, maintains that Zaghari has not been appropriately informed of the charges against her. Mizan Khabar, news outlet for Iranian judiciary, has spoken of Zaghari as “a well documented seditious element linked to Western spy agencies”. They maintain that she is an agent of the Thomson Foundation “with a mission to carry out cyber media projects aimed at spying and sedition”. Mizan Khabar adds that Zaghari’s husband Richard Ratcliffe is collaborating with “hostile media such as Persian BBC” to present her wife as a victim. Iran’s Human Rights Defenders Center reports that despite repeated efforts by the Zaghari family, there has been no response from the prosecutor’s office about the release of the 38-year-old mother. Following her arrest, Zaghari was transferred to Kerman. Kerman Revolutionary Guards announced in the following June that she was involved in “seditious plots”. She was then sentenced to five years in jail. After nine months in solitary confinement, she was finally transferred to Ward 2A of Evin Prison where she is currently incarcerated. Zaghari says she worked for Thomson Foundation as a project manager in charity work. Thomson Foundation maintains that it is not involve in any projects in Iran.